This article is about the newspaper published in Melbourne, Australia. For the newspaper published in Durham, North Carolina, USA, see The Herald-Sun (Durham, North Carolina). Not to be confused with The Sun-Herald newspaper published in Sydney, Australia or the Sun Herald published in Biloxi, Mississippi. The Herald Sun is a morning newspaper based in Melbourne, Australia, published by The Herald and Weekly Times, a subsidiary of News Corp Australia, itself a subsidiary of News Corp. The Herald Sun primarily serves Victoria and shares many articles with other News Corporation daily newspapers, especially those from Australia. It is also available for purchase in Tasmania, the Australian Capital Territory and border regions of South Australia and southern New South Wales such as the Riverina and NSW South Coast, and is available digitally through its website and apps. In 2017, the paper had a daily circulation of 350,000 from Monday to Friday. The Herald Sun newspaper is the product of a merger in 1990 of two newspapers owned by The Herald and Weekly Times Limited: the morning tabloid paper The Sun News-Pictorial and the afternoon broadsheet paper The Herald. It was first published on 8 October 1990 as the Herald-Sun. The hyphen in its title was dropped after 1 May 1993 as part of an effort to drop the overt reminder of the paper's two predecessors that the hyphen implied and also by the fact that by 1993 most of the columns and features inherited from The Herald and The Sun News-Pictorial had either been discontinued or subsumed completely in new sections. The old Herald and Weekly Times building in Flinders Street. The Melbourne Arts Centre Spire viewed from behind the rooftop signage for the Herald and Weekly Times building. The Herald was founded on 3 January 1840 by George Cavenagh as the Port Phillip Herald. In 1849, it became The Melbourne Morning Herald. At the beginning of 1855, it became The Melbourne Herald before settling on The Herald from 8 September 1855 - the name it would hold for the next 135 years. From 1869, it was an evening newspaper. Colonel William Thomas Reay was sometime literary editor and later associate editor, before becoming managing editor in 1904. When The Argus newspaper closed in 1957, The Herald and Weekly Times bought out and continued various Argus media assets. In 1986, The Herald's Saturday edition - The Weekend Herald - which had adopted a tabloid format, in order to distinguish it from the Monday to Friday editions' broadsheet format - was closed. The Sun News-Pictorial was founded on 11 September 1922, and bought by The Herald and Weekly Times in 1925. In its prime, The Herald had a circulation of almost 600,000, but by the time of its 150th anniversary in 1990, with the impact of evening television news and a higher proportion of people using cars to get home from work rather than public transport, The Herald's circulation had fallen below 200,000. This was much less than that of the morning Sun. With the only alternative option being to close The Herald, The Herald and Weekly Times decided to merge the two newspapers, and so after one hundred and fifty years, ten months and two days of publication, The Herald was published for the last time as a separate newspaper on 5 October 1990. The next day, The Sun News-Pictorial published its last edition. The Sunday editions of the two newspapers, The Sunday Herald and The Sunday Sun, were also merged to form the Sunday Herald Sun. The resulting newspaper had both the size and style of The Sun News-Pictorial. Bruce Baskett, the last Editor of The Herald, was the first Editor of the Herald Sun. After a progressive decline in circulation the afternoon edition was cancelled, the last edition being published on 21 December 2001. The News Corp Australia-produced mX had filled part of that gap, being freely distributed of an afternoon from stands throughout the Melbourne CBD until 12 June 2015, though generally not available outside that area. Recent editors include Peter Blunden, Simon Pristel, Phil Gardner and Bruce Guthrie. The Herald Sun is the highest-circulating daily newspaper in Australia, with a weekday circulation of 350 thousand and claimed readership of 1.26 million. According to third-party web analytics providers Alexa and SimilarWeb, Herald Sun's website is the 74th and 125th most visited in Australia respectively, as of August 2015. SimilarWeb rates the site as the 15th most visited news website in Australia, attracting almost 6.6 million visitors per month. In the context of an approaching election, the potential damage was considerable. The actual electoral impact cannot be known but readers were seriously misled. [...] The claims made in the original article were seriously inaccurate and breached the Council's guiding principles of checking the accuracy of what is reported, taking prompt measures to counter the effects of harmfully inaccurate reporting, ensuring that the facts are not distorted, and being fair and balanced in reports on matters of public concern. In June 2007, two Herald Sun journalists, Michael Harvey and Gerard McManus, were found guilty in the Victorian County Court of contempt of court after refusing to disclose the source of a story the pair wrote in the Herald Sun on Australian Government plans to scale back proposed veterans entitlements. The controversy resulted in agitation to change the law to introduce "shield laws" in Australia to take into consideration the journalists' code of ethics. Following Serena William's claim of sexist behaviour by umpire Carlos Ramos at the 2018 U.S. Open women's final, the Herald Sun's cartoonist Mark Knight drew an illustration of the match which was described as sexist and racist. In the cartoon, Williams is shown to have smashed her racket whilst a baby's dummy lays on the floor. Knight's illustration has been compared by some, including the political cartoonist and Washington Post columnist Michael Cavna, to illustrations popular during the Jim Crow era in the United States. Additionally, Knight is also accused of having "whitewashed" William's opponent, Naomi Osaka, who is of Japanese descent. 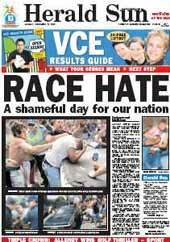 Following this, there was significant condemnation of both the Herald Sun and Knight for the use of this image by the author J. K. Rowling and Rev. Jesse Jackson amongst others . The Herald Sun defended its decision to publish the cartoon and two days after its initial publication, the cartoon was reprinted in part along with a series of other illustrations by Knight on its front page under the caption "WELCOME TO PC WORLD"
The Sunday edition is called the Sunday Herald Sun. Its counterparts in Sydney are The Daily Telegraph and The Sunday Telegraph. In Brisbane, it is linked with The Courier-Mail and The Sunday Mail. In Adelaide, The Advertiser and Sunday Mail. In Perth, The Sunday Times. In Hobart, The Mercury and The Sunday Tasmanian. In Darwin, The Northern Territory News and Sunday Territorian. ^ "Herald Sun". Archived from the original on 5 July 2008. ^ a b Samios, Zoe (11 December 2017). "News Corp withdraws from newspaper circulation audit, raising new questions about future of AMAA". Mumbrella. Retrieved 1 December 2018. ^ Kirkpatrick, Rod. "Press Timeline 1951-2011". Australian Newspaper Plan. National Library of Australia. Archived from the original on 15 April 2016. Retrieved 13 June 2016. ^ Crook, Andrew (18 May 2009). "A short history of bossy Herald Sun headlines: Read it now!". Crikey!. Archived from the original on 22 May 2009. Retrieved 18 February 2010. ^ "Herald Sun confirms status as Australia's No.1 newspaper with rise in latest audience figures". Herald-Sun. 17 May 2017. Retrieved 1 December 2018. ^ "Heraldsun.com.au Site Overview". Alexa. Archived from the original on 5 March 2016. Retrieved 2 August 2015. ^ a b "Heraldsun.com.au Analytics". SimilarWeb. Archived from the original on 4 March 2016. Retrieved 2 August 2015. ^ "Top 50 sites in Australia for News And Media". SimilarWeb. Archived from the original on 25 August 2015. Retrieved 2 August 2015. ^ "Adjudication No. 1270 (adjudicated February 2005)  APC 3". www.austlii.edu.au. Retrieved 8 May 2018. ^ https://www.facebook.com/comicriffs. "An Australian artist's racist Serena Williams cartoon receives swift and international blowback". Washington Post. Retrieved 1 October 2018. ^ Davidson, Helen (11 September 2018). "'Repugnant, racist': News Corp cartoon on Serena Williams condemned". the Guardian. ^ "Newspaper defends 'racist' Serena cartoon". 11 September 2018 – via www.bbc.co.uk. ^ "Tributes for TV expert Robert Fidgeon". news.com.au. Archived from the original on 31 May 2009. Retrieved 8 May 2018. Media Watch segment aired 1 May 2006, ABC. "Age vs. Hun: Off-field Biff". Video accessed online 6 June 2006.